gives the Liouville function . Integer mathematical function, suitable for both symbolic and numerical manipulation. 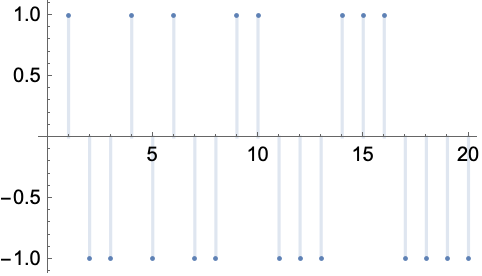 For a number n=u p1k1⋯ pmkm with u a unit and pi primes, LiouvilleLambda[n] returns (-1)k1+⋯+km. LiouvilleLambda[n,GaussianIntegers->True] is defined using factorization over Gaussian integers. LiouvilleLambda is a completely multiplicative function.